According to NBC News, this executive order also gives “regulatory relief” to companies that object to an Obamacare mandate for contraception in health care. That builds on the 2014 Hobby Lobby Supreme Court case, which found that the Affordable Care Act mandate that certain corporations must provide female employees with no-cost access to contraception was a violation of the Religious Freedom Restoration Act. Trump has showed dissatisfaction towards the Johnson amendment prior to signing the executive order, stating “I will get rid of and totally destroy the Johnson amendment and allow our representatives of faith to speak freely and without fear of retribution,” back in February. “We are giving our churches their voices back,” Trump stated. Vice President Mike Pence said the order reinforces the “importance of prayer” in the U.S. and said Trump has an “unshakeable faith in God and the American people,” Independent reported. 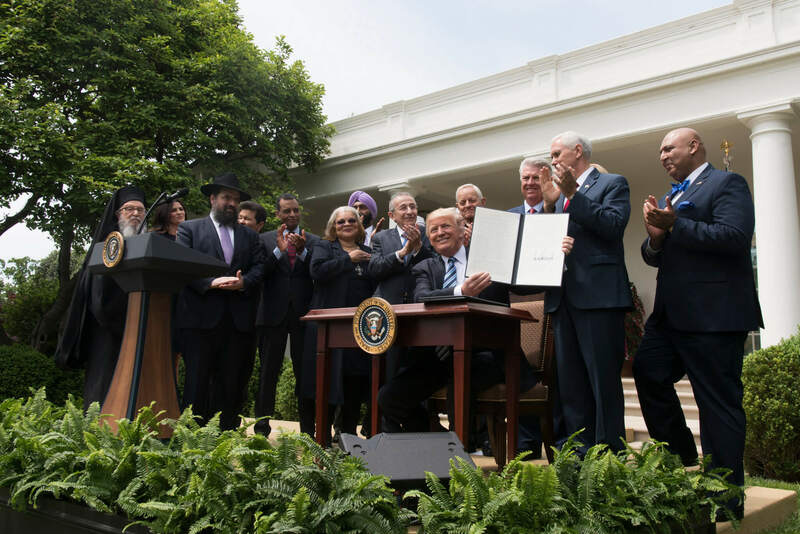 Despite the presence of various religious leaders during the signing of the executive order, the executive order itself favors one particular religious group. Considering the Muslim Ban that occurred just a few months ago and his rhetoric focusing on churches, it is more than apparent that the order is catered more towards supporting politically-active churches than promoting religious freedom as he claims. By allowing religious institutions to endorse political candidates, it not only removes the notion that America is under a government system that separates Church and State, but enforces discrimination under the guise of expressing religious freedom. The American Civil Liberties Union (ACLU) and Center For Reproductive Rights (CPR), have said they will challenge the order. “Reversing separation of church and state” How so? The Johnson Amendment is not a founding document, but dates back to 1954. The Constitutional injunction for Congress to not make “law respecting an establishment of religion, or prohibiting the free exercise thereof or abridging the freedom of speech” has nothing to do with the Johnson Amendment. In truth, Lyndon Johnson was probably trying to suppress the Black Churches who were powerhouses of the Civil Rights movement. Restoring the churches’ (and mosques’) right to speak freely is just the opposite of uniting church and state, since the Johnson Amendment absolutely was a law concerning religious establishments. Separation of Church and State is a two-way street; while modern secularists often minge about the interference of religion with the state, the earliest exercises of this principle were seen in the prevention of the state from interfering with religion. Then let us Muslims take advantage of this. Fine. Then let Muslims take advantage of this. Whatever any president does. Let’s get knowledge and exercise our human and American rights.